We've always got something good going on. From a pair of pralinés to private parties, every item makes a strong impression on first sight - and bite! All our orders come with our custom-designed package and seal, so they always look smart. To place an order, just send an email to kikiscocoa@gmail.com. We'll send you an invoice, or you can pay by PayPal. If you're outside the San Francisco Bay Area, we can also send chocolates via Shyp for a small surcharge. 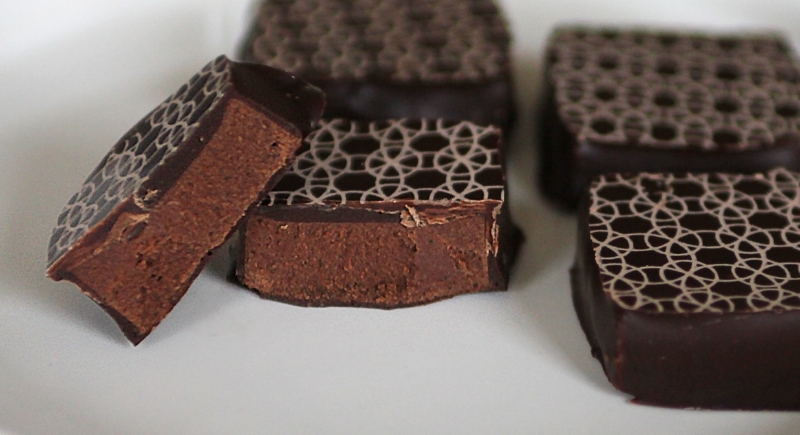 And if you like chocolate on the regular, check out Kiki's Cacao Club for our monthly subscription. For your special table setting, your next big event, guest gifts, host gifts or something special just for yourself. Go with the pralinés you like best or mix and match. Let me know at least a week in advance if you want my chocolates for a big event. Two chocolate pralinés in a bag. Boxes of four and twelve pralinés. Just email kikiscocoa@gmail.com for any order, i will get in touch with you, confirm, and send an invoice. I do accept paypal. If you can't meet Kiki's Cocoa, we can still meet you. We are shipping to all States in the US in the cooler months (except HI). I will only pass on the additional shipping costs i am paying for with shyp.com. Shipping is about $10 for 1-3 small boxes - think post-office prices plus $5 for the pick-up and packaging. The final amount will appear in your invoice, like at any post office.